NEED FINANCING, THE PLUMBING PRO CAN HELP. The Plumbing Pro works with Wells Fargo and GreenSky to provide our customers with the services they need, when they need them. Don’t pay too much!!! Financing is simple just follow these 3 steps and the link at the bottom of the page. The financing process is very quick but not in every case. If we were unable to find funding for you please call us back. 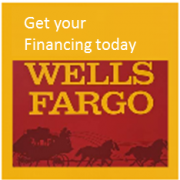 We accept all major credit cards and offer financing through Wells Fargo.